Scott Brown is ready to return to the Scotland squad for the key World Cup qualifying double-header against Wales and Belgium later this month. The Celtic captain missed the opening home draws against Serbia and Macedonia with a hip problem which has needed careful management this season. 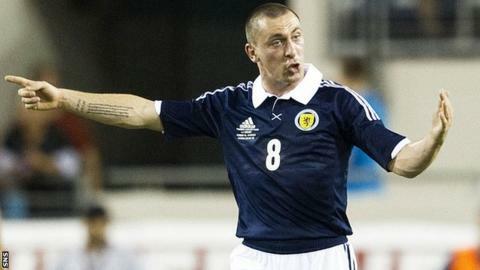 "Hopefully I can make the Scotland squad," said the 27-year-old. "I am feeling good, I have played four or five games in the last couple of weeks and everything feels good." Last week, Celtic boss Neil Lennon said that he would base the midfielder's schedule around playing in Celtic's important games and Scotland matches. Brown was rested for several domestic games at the start of the campaign and sat out last Tuesday's League Cup win over Raith Rovers. "I think the rest has definitely done me good, that's for sure," added Brown, who will feature against Spartak Moscow on Champions League duty. After a goalless draw in their first group game at home to Benfica, Brown is looking for Celtic to go one better against the Russians. "I think we played well at home (against Benfica), I think we were unlucky that we didn't create as many chances as we would like to have done," he explained. "We have got players in the team who can score: Kris Commons who is dangerous from 20 yards out, Gary Hooper is on form as well so hopefully we can take this into the game. "We have had a few away victories in Europe this season and hopefully we can take that form into this game as well. "But it is going to be hard, Spartak are a good team and we are going to have to play very well." During the media conference in Moscow, Brown teased one local journalist who asked if the Celtic players watched the William Wallace-inspired film 'Braveheart' before games. "Yes, we watch Braveheart and we put our kilts on, just before we go out to warm up and we all dance together," Brown replied, tongue in cheek.